Explore Thachi Valley, a little known valley in the unexplored mountains of Himachal Pradesh on a short two-day itinerary. Across acres of plateaus and grasslands, you'll trek to the Hadima peak, visit the Bithu Narayan temple, dip your feet at the Ashu Alli river stream and relax besides the waters of the Ropa pond. En route, you'll stop at vantage points to gather mesmerizing views, and interact with local shepherds and farmers. After a day exploring the outdoors, you'll spend the night in tents surrounded by deodhar trees and apple orchards. NOTE: A minimum of 2 travellers are required to book this Thachi Valley trek. Thachi Valley, an off-beat destination in the heart of Himachal Pradesh, is perched between the mountains that overlook the Great Himalayan National Park. A nature lover's paradise, the valley is criss-crossed with river streams and waterfalls that inspire lush grasslands and terraced farms. 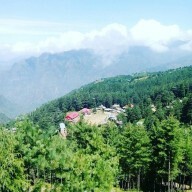 The valley is sprawling green with forests in the summer and layered white with snow in the winter. A perfect location to explore the beauty of mountains away from the crowds, Thachi Valley remains one of Himachal's best kept secrets. • Go trekking in the Thachi Valley and explore an undiscovered gem. Travellers are required to adhere to the instructions of the trek leader during the trek to Thachi Valley. Consumption of liquor, drugs, tobacco products and cigarettes is strictly prohibited during the trek to Thachi Valley. For cancellations made more than 7 days before departure of the Thachi Valley trek: 90% refund. For cancellations made 7-2 days before departure of the Thachi Valley trek: 80% refund. For cancellations made less than 2 days before departure of the Thachi Valley trek: 60% refund. The tour operator takes utmost care to ensure safety of the travellers and shall not be held responsible for any mishap or accident during the trek to Thachi Valley. There is no pick-up for this Thachi Valley trek. There is no drop-off for this Thachi Valley trek. Today, you'll visit the Ropa Pond and Ashu Alli water stream. The Ropa Pond is a crystal clear pond located besides an ancient temple. Take some time to relax on the banks of the pond before trekking to the Ashu Alli water stream. Return back to campsite by early afternoon. You'll check-out of the campsite by 15:00 hrs. Depending on availability, you can also extend your stay at the campsite for an additional cost. Your trip ends here. Visit waterfalls and river streams. Trek to the Ropa Pond and Ashu Alli water stream before checking out of the campsite. Today's meal package includes breakfast at the campsite and packed lunch while trekking. All meals will be vegetarian. Depending on availability, you can even extend your stay at the campsite for an additional cost. Check-in and check-out times are reasonably flexible.